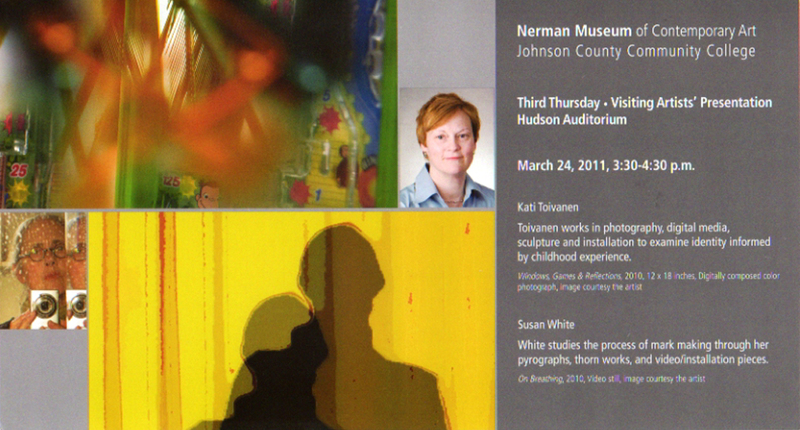 Along with Kati Toivanen I’ll be giving a talk at the Nerman Museum on March 24. This video excerpt is from a work I made upon my return from a residency program in Tokyo last August. Unable to speak the language with any effect I realized the experience of gaining information in a sensory manner, a kind of cultural osmosis. On Breathing is a response to blending into the atmosphere in Japan. The audio track is from Liquid Air, composed by Meredith Monk who often uses organic sound, as a way of communicating beyond words. I found that Liquid Air was an apt articulation of my experience of breathing in the culture of Japan. This work was exhibited in December in one of the exhibitions celebrating the 125th Anniversary of the Kansas City Art Institute.